No one likes to pick up the phone or open the mailbox only to discover a debt collector on the other side. Sure, debt collectors are allowed to contact you regarding legitimate, unpaid debts, but they also have strict rules they must follow when doing so. Among these rules is the Fair Debt Collection Practices Act. 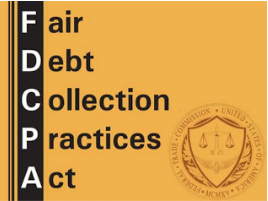 In 1977 Congress enacted the Fair Debt Collection Practices Act, aka the FDCPA, with the goal of protecting consumers from unfair, deceptive, and abusive debt collection tactics. The FDCPA, primarily enforced by the Federal Trade Commission (FTC), does not apply to original creditors. Instead it applies only to third party debt collectors (think collection agencies, debt attorneys, debt buyers, etc.). Additionally, the FDCPA pertains only to personal debts, not business debts. Here is a look at some of the regulations that are imposed upon third party debt collectors under the FDCPA. Per the FDCPA, your debt collectors are prohibited from harassing you or resorting to abusive practices when they contact you. Illegal actions might include any of the following. Debt collectors cannot threaten violence or blackmail. Debt collectors cannot use obscene language when contacting you. Debt collectors cannot annoy you repeatedly over the phone. Debt collectors cannot publish a list containing names of their debtors. Lying is also disallowed according to the FDCPA. Thanks to this federal law, the following actions are off limits. Debt collectors cannot pretend to work for the government, a law firm, or the credit bureaus. Debt collectors cannot threaten to arrest you. Debt collectors cannot threaten to sue you unless they actually intend to do so. Another benefit of the FDCPA is that it restricts how (and with whom) your debt collectors communicate. For example, debt collectors are not allowed to engage in any of the following actions. Debt collectors cannot contact other people about your debt. Debt collectors are not allowed to contact you by post card. Debt collectors cannot call you before 8 AM or after 9 PM (your local time zone). Debt collectors cannot contact you at your place of employment if you inform them that you cannot receive calls at work. The FDCPA also restricts debt collectors from engaging in unfair practices while attempting to collect a debt. Some examples of “unfair” practices are detailed below. Debt collectors cannot collect or attempt to collect fees, interest, or other charges above the cost of your debt unless your state or your agreement with the original creditor specifically allows them to do so. Debt collectors cannot deposit post-dated checks prematurely. Debt collectors cannot threaten to seize your personal property (unless they have a legal means to do so). If you believe that a debt collector has violated your rights under the FDCPA, there are a number of actions, which you could take in response. You can report any alleged violation of the FDCPA to the FTC, the Consumer Financial Protection Bureau (also known as the Bureau of Consumer Financial Protection), or your state attorney general. You can sue a debt collector for up to 1 year after the date of the violation. Ready to repair your credit problems? Our certified credit professionals at Financial Renovation Solutions can help. CLICK HERE or call us at 214.856.0068 to schedule a free credit analysis today.